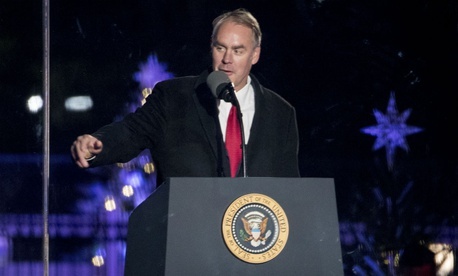 Interior Secretary Ryan Zinke, already under investigation for questionable travel by air, booked government helicopters this summer for events at sites that would have been reachable within hours by car from Washington, including some that could be seen as political, according to a Thursday report by Politico. Travel records released under the Freedom of Information Act showed that Zinke and his staff spent $14,000 on Park Police helicopters for quick travel to official events squeezed around such events as a horseback ride with Vice President Mike Pence and the swearing-in of Zinke's successor as House member from Montana, Republican Greg Gianforte. Zinke and his chief of staff Scott Hommel on June 21, for example, took a helicopter to an emergency management exercise in Shepherdstown, W. Va.—just over 70 miles away. The $8,000 expense was deemed necessary, Politico said, because official business would prevent him from leaving before 2:00 p.m. to make the two-hour drive. Zinke also traveled by helicopter on July 7 to Yorktown, Va., at a cost of $6,250, to tour the Revolutionary War battlefield, attend a boating industry roundtable and fly over the site of a controversial set of power transmission lines that Dominion Energy is building over the James River. Documents show his aides expressing concern that car travel on I-64 would be slow due to construction, as Zinke planned to be back in Washington by 4:00 p.m. for the vice presidential horse ride. Zinke’s air travels out west, which may appear to dovetail with Republican political events attended by himself and his wife—a GOP activist—are being probed by Interior’s inspector general and the Office of Special Counsel, which enforces the Hatch Act restricting the partisan political activity of federal employees.